Do you ever question God's ability to catch you when you fall? Do shame, fear, and brokenness keep you from fully trusting God? Do you secretly believe your dreams are unreachable? Do you secretly believe your dreams are unreachable? You are not alone. This is a book about trust. How we fight it. How we learn to do it. How it transforms us. Life is not safe. That reality slips over us as we grow. Our response to the Father in that reality allows us either to swing higher and higher with the trust of a child . . . or fearfully shrink back from the swing set altogether. As we weigh that choice, God whispers: Trust me. 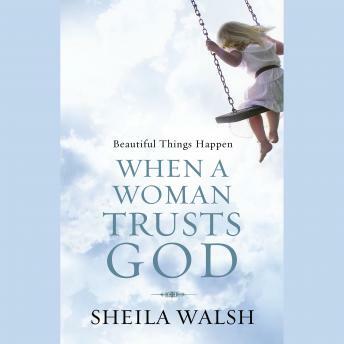 In a remarkably transparent account, author and speaker Sheila Walsh opens wide her lifelong battle with trust and the moment-by-moment choices she made to follow where God led. Sheila has lived a life ruled by the "hidden places" of insecurity and brokenness and knows the overwhelming beauty of a life wholly handed over to Christ. As you encounter her struggles and triumphs, you also meet ten of the Bible's transformed-Tabitha, David, Paul, and others-who teach us that in spite of overwhelming circumstances, just one trusting encounter with Christ sets beautiful things in motion. It can resurrect dreams, instill purpose, and ignite hope.